Hazardous Materials Train derails in Louisiana. According to officials, a train hauling hazardous materials derailed in Louisiana on Sunday, August 4th, 2013. Two rail cars were leaking hazmat chemicals, which forced the evacuation of about 100 homes. An individual who was near the hazardous situation of the train derailment fled to the hospital complaining of eye irritation. The train derailed in Lawtell county, 60 miles west of Baton Rouge. Fully customizable hazardous materials storage containers by US Chemical Storage. Officials stated, out of the 20 rail cars of the Union Pacific train, two rail cars were leaking hazardous chemicals. One of the rail cars was leaking sodium hydroxide, and the other was leaking lubrication oil. The hazmat team from Union Pacific was on the scene shortly after the derailment. Hazardous material situations always needs to be carefully assessed, in due time. There were two people on-board the train, an engineer and a conductor – no one was injured. Sodium Hydroxide is used in many industries. The hazardous chemical is widely used in the manufacturing of paper, water treatment, soaps, detergents and drain cleaners. Used as a strong base in the chemical industry as well as in the oil industry. Poor quality crude oil can be treated with the chemical to remove impurities. The hazardous chemical is also used for food preparation; dealing with the cleaning and peeling of fruits and vegetables. Sodium hydroxide can cause burns and blisters to occur if handled improperly. If sodium hydroxide is heated, it can become flammable. Hazardous materials storage buildings by US Chemical Storage offer a safe, secure and compliant storage solution for your chemical inventory. 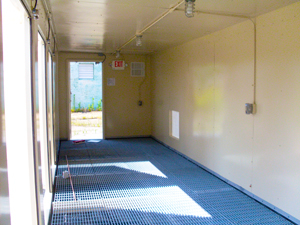 Our hazardous materials storage buildings are designed by professional engineers for quality assurance. All hazardous materials storage buildings offer a 15-year structural warranty and a 2-part epoxy top coat to protect your chemical inventory from extreme weather conditions. These 100% compliant hazardous materials storage buildings are constructed from heavy-gauge steel for superior strength and durability. Safely store your chemicals in a reliable hazardous materials storage building by US Chemical Storage for a safe and secure storage atmosphere. Our Strength is Your Security.